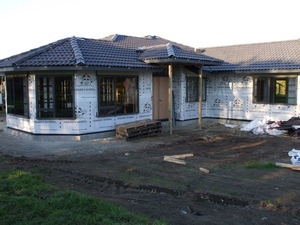 This was our original house - it was originally a small cottage and had been added on to over the years.� It needed a lot of work doing to it and after getting some quotes and things (around NZ$100,000)we realised that it was going to cost more than the actual house was worth. 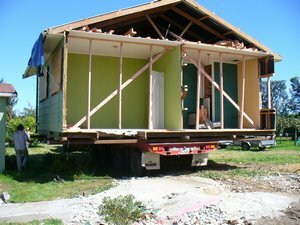 After clearing the area around the house of all vegetation and having the power, water and satellite disconnected the next step was to get the house moved.� This is quite common in New Zealand.� We sold the house for $12,500 and the new buyer payed for all the removal costs to their site.� In our case the house was only moved a few kilometres away though the house movers told us that they take houses all over New Zealand.� Our house was on piles which makes it easier to move but they can move houses that are on concrete pads as well as quite large buildings - see "Hotel du Wheels" in Wellington. 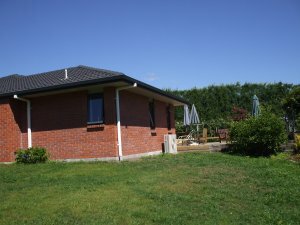 The house is then�readied for removal.� All the vegetation has been removed and mulched including the large�camelia tree.� As many plants as possible�were transplanted.� (VIEW BETWEEN�B and C). 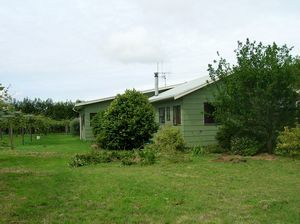 This view of the house is looking to where the tamarillo tree was. 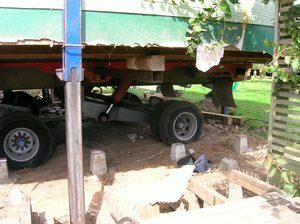 Huge hydraulic jacks are used to lift the house which has been strengthened inside. 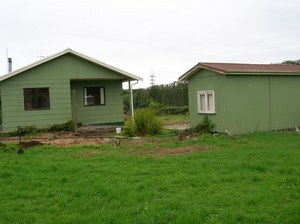 The carpet has been rolled up and the light fittings removed.� As the�photo on the right was being taken the house was slowly being lifted by the jacks with lots of creaking and moaning.� The workmen were spaced around the house watching for any problems.� It was quite amazing being able to see the underneath of�your house slowly unfold before your eyes.� When the house was fully secured onto the jacks we got to search under it for any 'treasure' - unfortunately not much to find - lots of bottles, a childs shoe and a rusted cap gun. 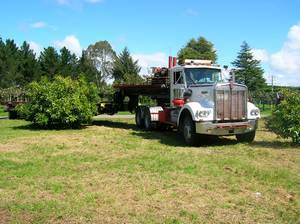 Then the BIG trucks arrived - the first one is seen here negotiating the Avocado trees.� The tree on the left eventually had to go even though great effort was made to lift the house over the top of it. 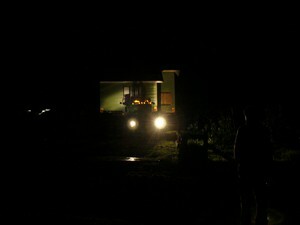 The truck seen� making its way between the house and sleep-out. 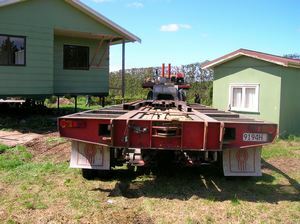 Then reversing under the house slowly.� Each wheel is individually controlled and hydraulically operated.� The trailer has its own driver (as well as the truck driver).�� The trailer can be lifted to quite a height to get over obstacles and can also be tipped for the same reason - quite nerving looking at your house tipped over to one side to get over kiwifruit vines and over fences. 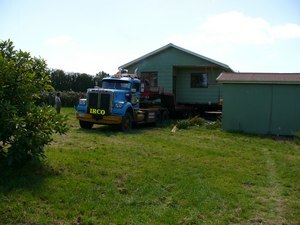 The trucks were then parked up on our place and the workmen went home for a sleep.� Housemoving trucks are not allowed on the road until after 10pm.� Sooty, the cat, meanwhile investigates the parted parts of her old house and gets stuck up in one of the trailers so we have to manhandle her down. 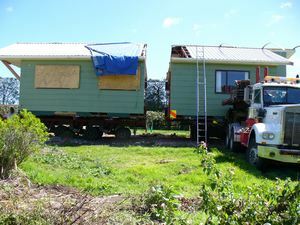 Then its all on for the move.� Sarah (daughter) and I are lucky enough to get a ride in the pilot car so this view is taken as the red and white truck is coming down Te Matai Road about midnight.� Flexible boards are fixed to the roof of the house as can be seen in the left hand photo�to enable the house to go under the power lines.� However at the bend of the road the flexi-boards got tangled in an overhanging tree as well as the power lines so this created a bit of a road block.� Beside the pilot vehicle, there is another housemoving vehicle in front of the house then the linesman in his vehicle, then the house and then another vehicle at the back - all with flashing lights and the house all flood lit.� It is at times like this that you notice mail boxes close to the road, overhanging trees and power lines and sharp corners that are not built for wide loads.� The house made it to its new site but not before the chain saw had to be started up to cut out one shelter belt tree that was not quite in the right place.� Thank heavens all the neighbours had come out to have a look or one may have wondered at the noise! 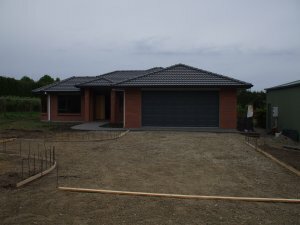 So it was goodbye to our old house and then work can start on the new. 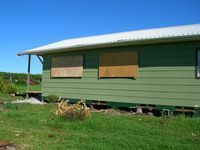 Our new house is to be built on�a concrete pad with timber framing.� However the external walls are brick with concrete roof tiles.� This is quite a change for both Barry and I who have always lived in wooden homes. 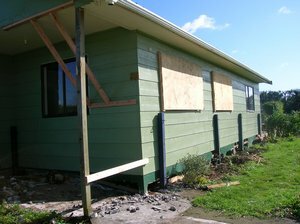 We shall miss the creaking during high winds - not! 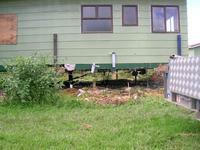 Below is the resulting mess after the removal of the old house looking towards the deck (VIEW C). 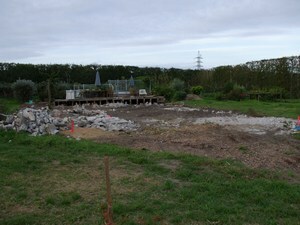 First the rubbish (ie broken concrete and old piles are removed) then the topsoil is dug out and stored for later use. 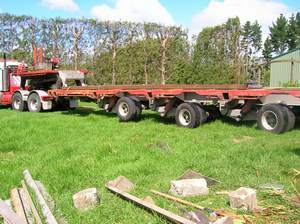 Then the base is filled up and up and up with metal and rollered as they go. Looking almost due north. 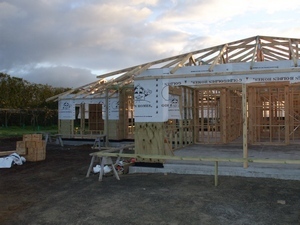 With typical kiwi ingenuity the sleep-out is moved using two forklifts to the Kiwifruit packhouse across the road for use as a Smoko Hut.�� Meanwhile the builders are busy laying out the blocks for the outline of the house.� (VIEW B)� Reinforcing mesh is laid and is tied to the concrete blocks and reinforcing rods. 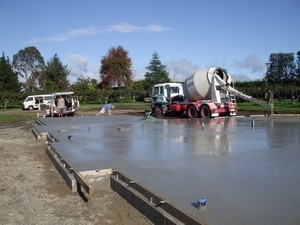 Then the concrete base is poured leaving the outlets for the plumbing in place. 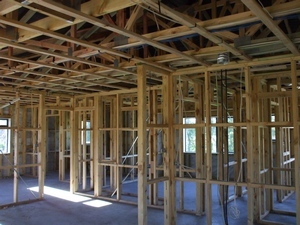 Once the concrete is dry the framing is erected.� It arrives all pre-nailed and the builders put it together like a giant Mecano set.� The framing is 100 x 50mm (4 x 2") treated pine framing with metal bracing and plyboard bracing in the corners and between large window areas.� (VIEW B)� The large open gap is for the double garage door.� The framing is built on to the concrete pad and the bricks are laid starting on the lower level - they are connected together at various points but are otherwise free-standing.� This is to allow for movement during earthquakes. 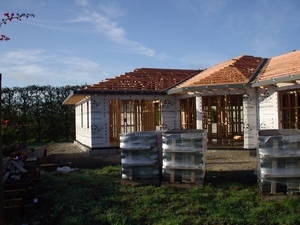 The roof struts also arrive pre-nailed and are lifted on with a Hi-Ab and then braced and nailed in place.� (VIEW B)� Then the roof is overlaid with timber battens�to attach the concrete tiles to.� The walls are covered with�thick builders paper.� The roof is later covered with building paper too.�� (VIEW D)� The deck is just to the left of this photo. 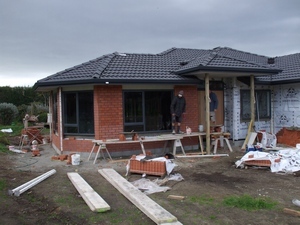 The tiles are on, and the windows and external doors are all in place ready for the bricklayers - the same view a few weeks apart. 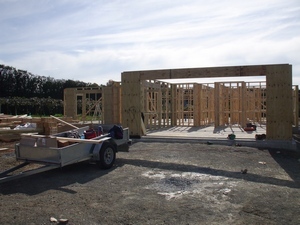 (VIEW C).� This is the front door with the lounge to the left and my office to the right.� The garage is on the right with the window.� The guttering has also been installed. 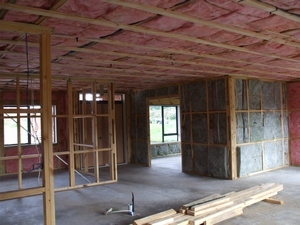 Meanwhile inside the plumbers and electricians have been busy running cables and piping through the ceilings and walls.��We have gone all out and have had databoxes fitted to each room (except the bathrooms and walk-in wardrobe) to carry broadband/tv/phone connections.� We are only the second home that Golden Homes have built to have had this but no doubt all new houses will have them soon.� This view is from the kitchen looking towards the master bedroom and ensuite. 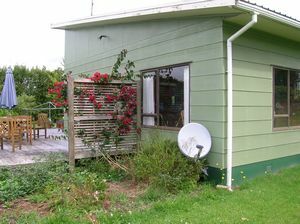 This is VIEW D - the corner of the house is about where the clothes line was originally.� The deck is to the right.� The second view is along the house� towards the garage.� The camellia tree and tamarillo tree were under there somewhere.� The downpipes are on - and there are lots - it is not called the Bay of Plenty for nothing - plenty of rain mostly and New Zealand's Clean Green Image is mostly because the rain washes the dust away! 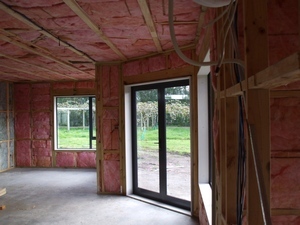 Looking across the kitchen to the lounge and front door and my office to the left and then from the same point looking across to the doors on to the future deck.� The insulation is all in - fibreglass Batts.� The grey ones are 'noise reduction' Batts so I don't have to hear the rugby. Next the gib (gibralter board)is fixed to the studs with screws and glue. 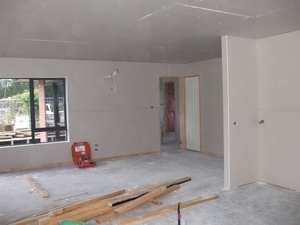 Then the plasterers come and do all the 'stopping' ready for paint and wallpaper. 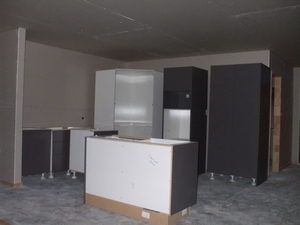 Then the kitchen arrives. 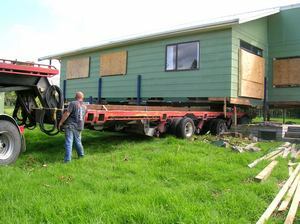 It has already been 'built' in the factory in Rotorua but arrives in pieces. The next day a man comes and puts it all together. 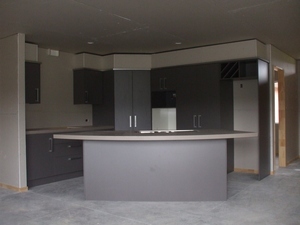 Still no appliances. though. 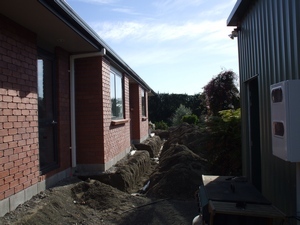 At last some more work on the outside of the house. 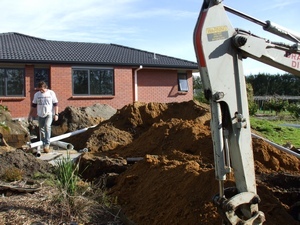 The drainlayer making a mess of the back lawn. 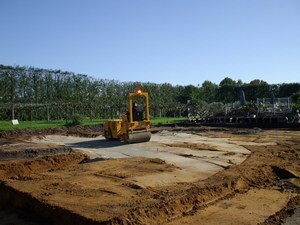 He is putting in a septic tank. 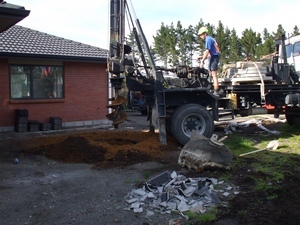 Then the 'Hole Man' drills some large holes around the place for soak holes for the storm water drainage. 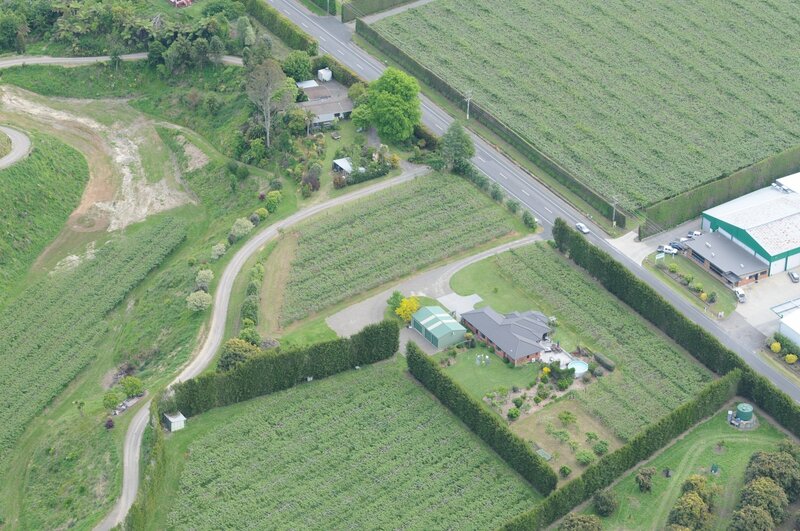 We are 5kms from town so are not on any sewage or storm water scheme though our water is at the gate. 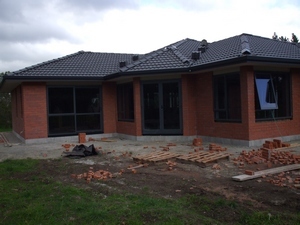 Meanwhile inside the house, the walls have been plastered, the ceilings and architraves painted, the electrical fittings fitted, the carpet and vinyl is down, the tiles are up, the bathroom etc is all fitted and working, so we are nearly there. 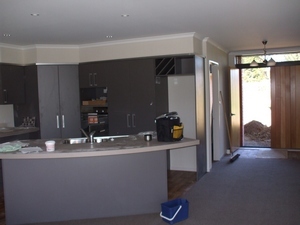 The kitchen looking towards the front door. 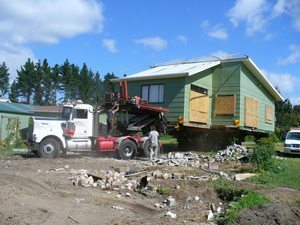 The cleaner from the building company is here giving the place the once over. 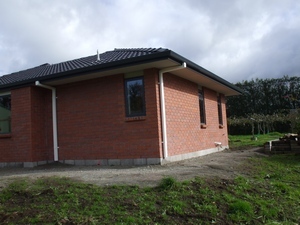 The toilet (almost always seperate in New Zealand) looking towards the bathroom. 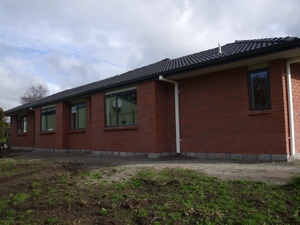 Along with our en-suite we have put clear glass in the windows so you can look outside at the view of the gardens and orchard. 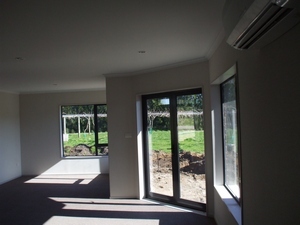 Eventually the windows will have sun filter blinds fitted if privacy is needed. 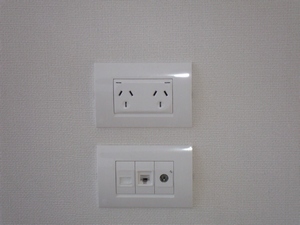 The latest in electrical sockets and the 'data box' with its connections for the telephone, internet and television. 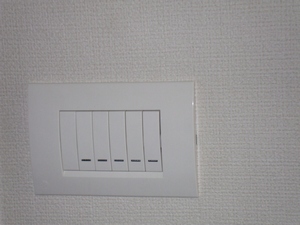 The latest light switches so we can control which ones are on and off - once we learn which is which of course! 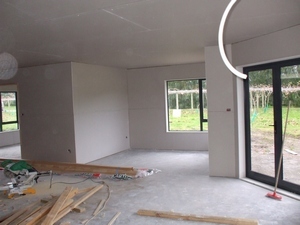 We got to move in on Wednesday 29 August so quickly rushed our beds inside so we could sleep there - the novelty of the garage was wearing off by this stage. 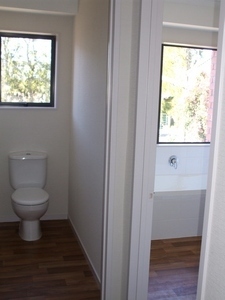 Over the next few months we got curtains and sun blinds plus the odd bit of new furniture here and there. Even managed to hang some of the photos and art work. 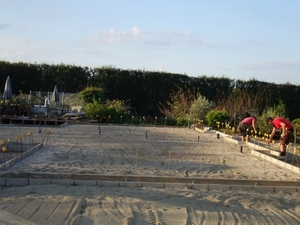 Then we got another builder in to build the deck to connect the new house with the old deck and swimming pool. 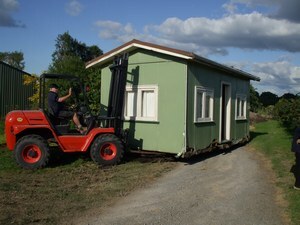 It is huge and a great asset in the summer - instead of a rail the builder built us a long seat which can seat about 20. 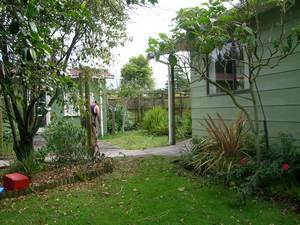 Have had numerous barbeques and pot-luck dinners on it. 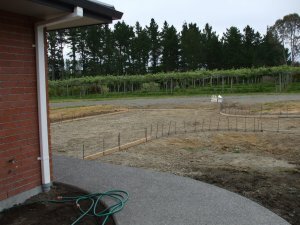 Then we set to work getting the driveway and path to the front door built. 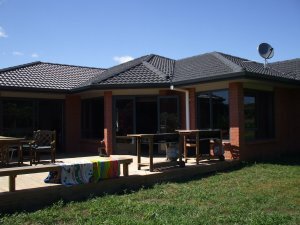 Some views as at the 19 January showing the deck from the north - its a bit windy hence the towels all over the place! 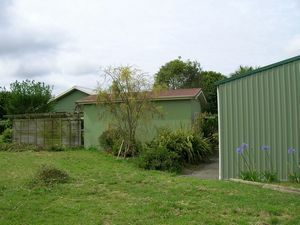 The second photo is a view looking back towards the deck and from the same position (VIEW A) back towards the green shed and garage. 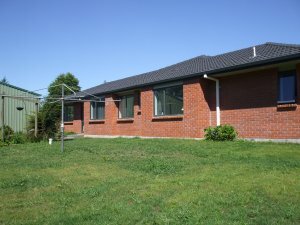 We have had the lawn sown but have not planted the gardens around the house yet - will wait until next spring for those. 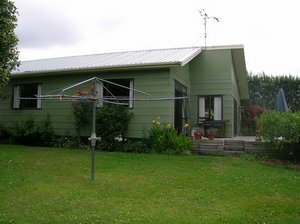 Will add some photos of the inside of the house after the "char/Mrs Mop/the lady who does" (actually me!) have tidied up a bit! May even find some of Sooty having a kip somewhere.